Shark bodies denting the dome of the nation’s capitol? Mark Cuban and Ann Coulter in charge of that capitol? 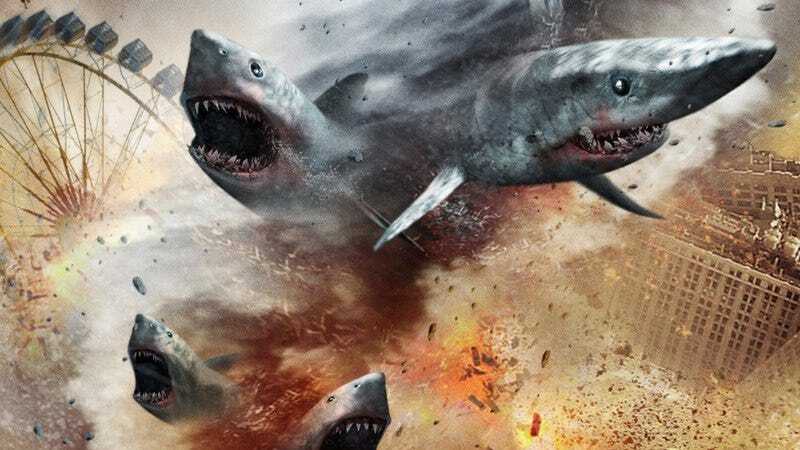 No health or pension benefits for Sharknado’s hard-working crew? All of these sharktrocities are best met with an emphatic, “Oh Hell No!” Hence, Sharknado 3: Oh Hell No!, will whirl through Washington, D.C., where shark professionals Tara Reid and Ian Ziering will “Oh Hell No!” their way through sharks, politicians, pundits, and Syfy channel relevance. “We wanted this third title to boldly go where no shark movie has gone before,” said shark-movie envelope-pushing Syfy senior vice president Chris Regina. “Sharknado 3: Oh Hell No! embraces the larger-than-life irreverence that has made these movies so popular and entertaining.” Sharknado 2: The Second One was Syfy’s most-watched original film ever, and that was with a silly, but boring subtitle. Say “Oh Hell No!” to anything besides watching Sharknado 3 on Wednesday, July 22.